Also available (unsigned) on Amazon, Barnes and Noble, Books A Million, and bookstores throughout each state. Your guide to the most beautiful waterfalls in the two Virginia's. Countless waterfalls decorate the scenery across Virginia and West Virginia, from Dark Hollow Falls in Shenandoah National Park to the Falls of Hills Creek in the Monongahela National Forest. This revised and updated guidebook covers more than 150 of the most beautiful and impressive among them. Organized geographically and ranked by beauty, Waterfalls of Virginia and West Virginia makes it simple to find the best waterfalls in each state, as well as the ones nearest you. In this informative guidebook, I feature all the information you need, including directions, distance, hike difficulty, and more. Professional photographs of every waterfall are paired with important details, including height, photography tips, and the best time of year to visit. A curated look at the locales, including not-to-miss sights and activities on-site, as well as things to do in the surrounding area, make this your essential guide to seeing the best waterfalls in Virginia and West Virginia! 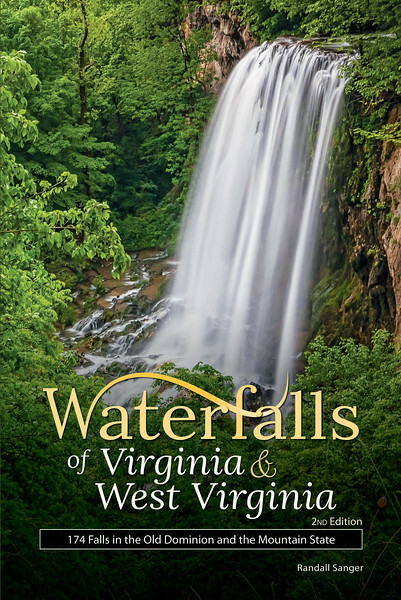 This book prominently features 75 waterfalls in Virginia and 75 waterfalls in West Virginia, and for good measure, I throw in a dozen more selections at the end of each state's section. Obviously, this is not an exhaustive compilation of Virginia and West Virginia waterfalls, but I simply share with you a selection of the top waterfalls each state has to offer. I love the layout and design of this book! Within each state's region, the falls are featured according to three general categories: Top 10, Must-See, and More Falls. Naturally, the Top 10 Waterfalls are what I consider the 10 best waterfalls in each state, mostly due to their sheer beauty, but also due to consistent water flow and other factors. 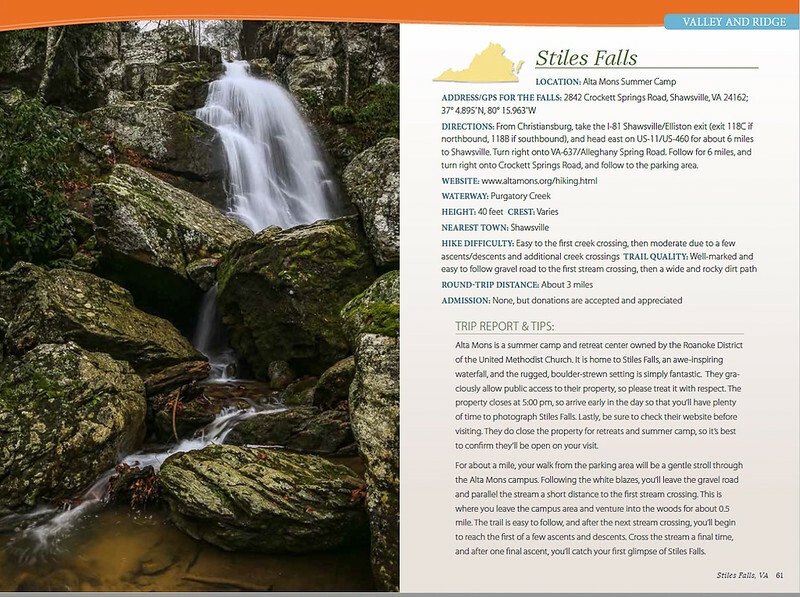 Each Top 10 Waterfall will be featured on four pages, with a two-page photo spread followed by two pages of information. 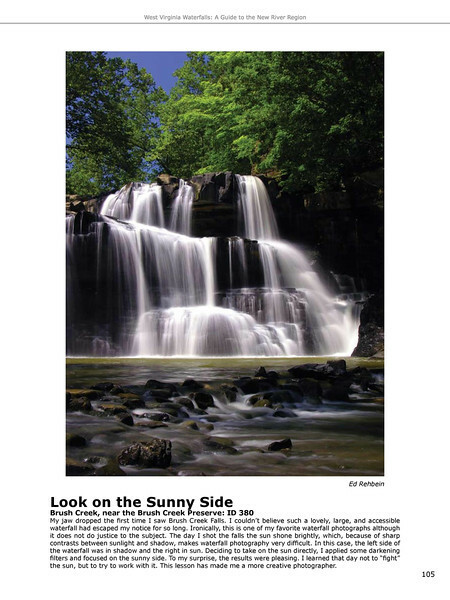 The Must-See Waterfalls are also prominently featured with a full-page photo and a full page of information. 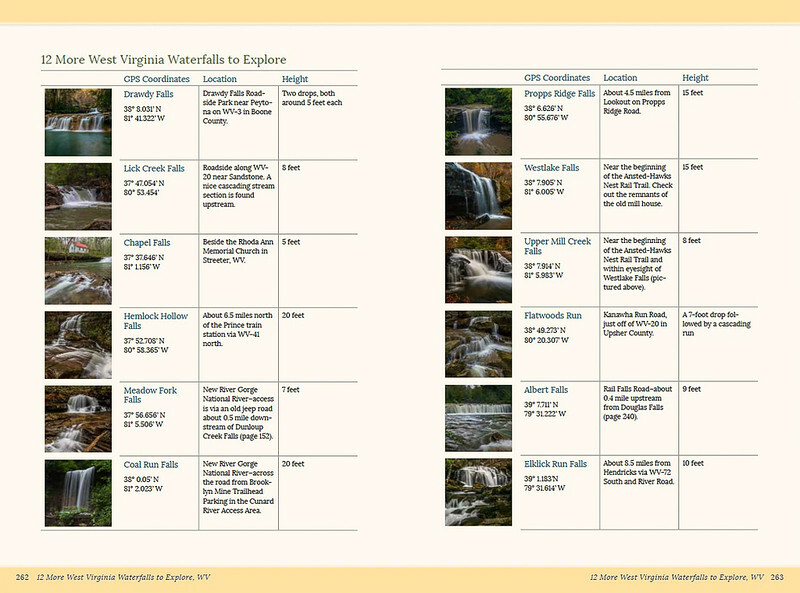 The waterfalls in the More Falls category receive a little less exposure, with two waterfalls on one page, followed by information about each waterfall on the opposite page. 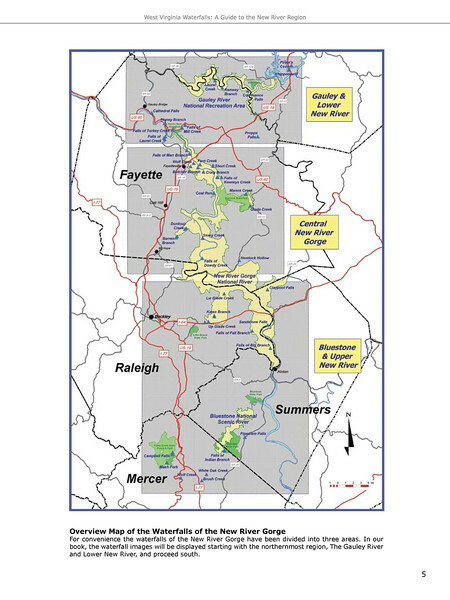 Lastly, at the end of each state's section you will find 12 More Waterfalls to Explore; these waterfalls didn't quite make the cut for more recognition, but they are certainly worth seeking out if you are in the general area. Examples of each category are below. 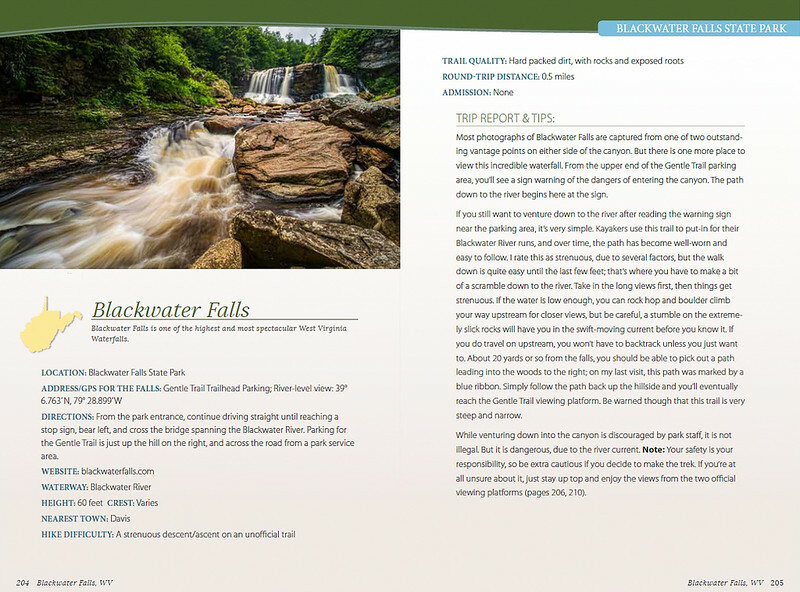 "This is such a beautiful book of waterfalls! Expertly written with details about each plus explanations of easy to follow directions that will lead you to the sight of each of these wondrous cascades." "It’s beautiful! Very nicely put together, spectacular photos throughout, lots of helpful and useful information and great quality! Get one if you love waterfalls! You won’t regret it!" "What an outstanding piece of work! 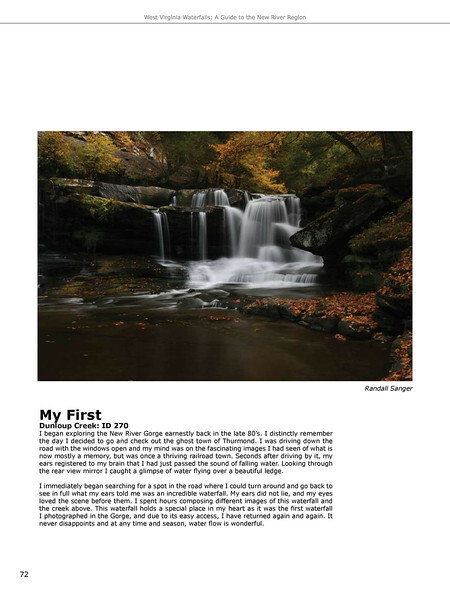 Beautiful photographs, GPS locations, tips on shooting the falls and much more! I’ve got hours of enjoyment at my fingertips and I can’t wait to learn all about these waterfalls!" "Our books arrived today. Two old people sat on the back porch and leafed through the book making random comments about the beautiful pictures and the complete details of each waterfall. After seeing the book, we realize we should have ordered two more books. I will do that later today. You did an excellent job, Randy. Personally, my favorite part is the dedication." "Oh my!! 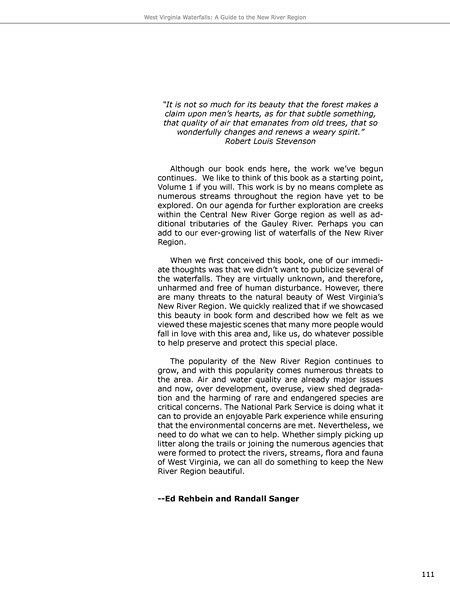 Randall Sanger this book is beautiful! Your hard work has paid off and you should be proud! I am going to study this book as if there were a test at the end!" 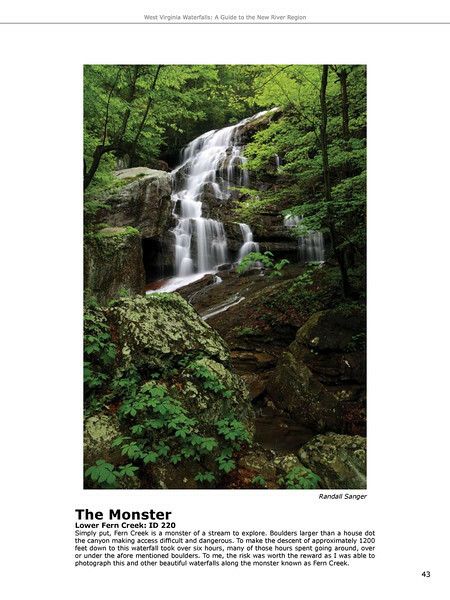 "So excited, I received my new waterfall book by Randall Sanger! 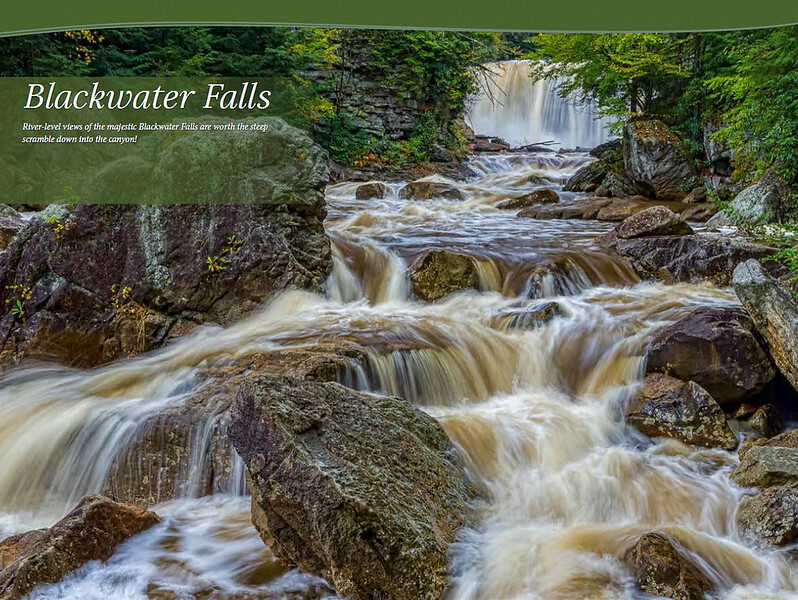 This book is loaded with attractive waterfall images taken by Randy, and full of details about each fall. Y'all git one!" "Pretty happy camper right now. Absolutely awesome book and well worth the wait. Congrats Randall!!" "What a wonderful book and travel guide. I am a bit experienced with publishing, photography and travel. This is the best composite of all three that I have experienced." "I received your new book today and I must say, it's great! The photos are amazing and the guide has tons of helpful information for finding the waterfalls. I wish more photography guidebooks were as well made." "Amazing book that will keep me on the waterfall trail for a long time to come." 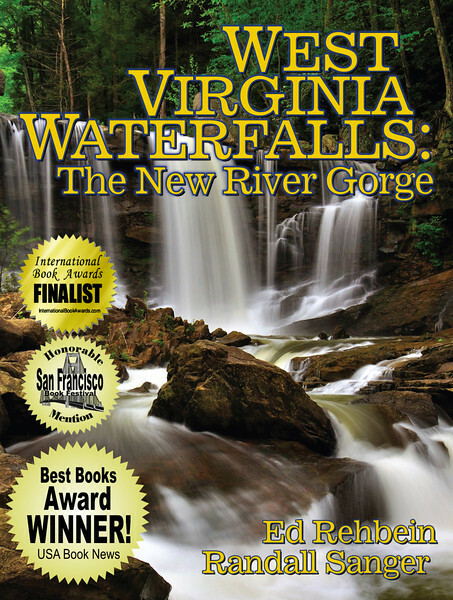 In our multi-award winning book West Virginia Waterfalls: The New River Gorge my coauthor, Ed Rehbein and I share beautiful photos as well as personal recollections and anecdotes of our time spent capturing each waterfall. 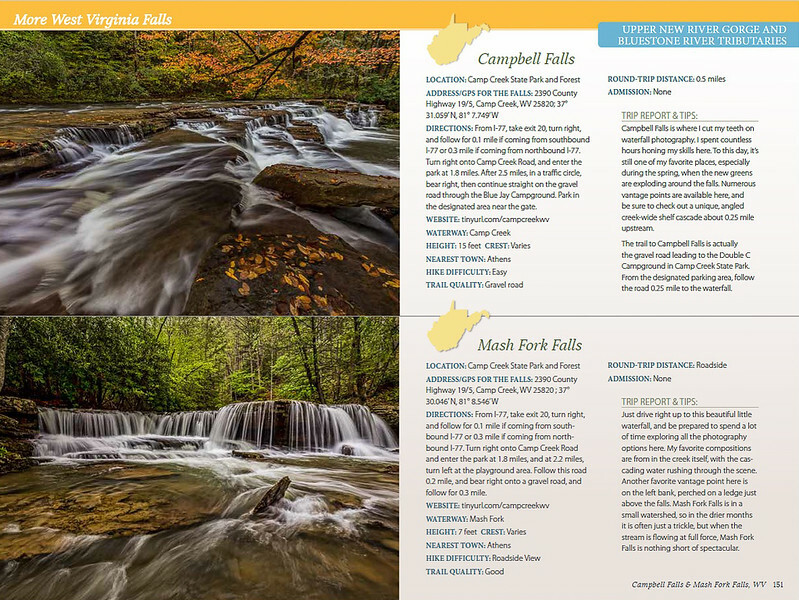 This full color, coffee-table style book features over 100 images of the waterfalls of the New River Gorge region of West Virginia, as well as full color maps to each section of the New River Gorge. 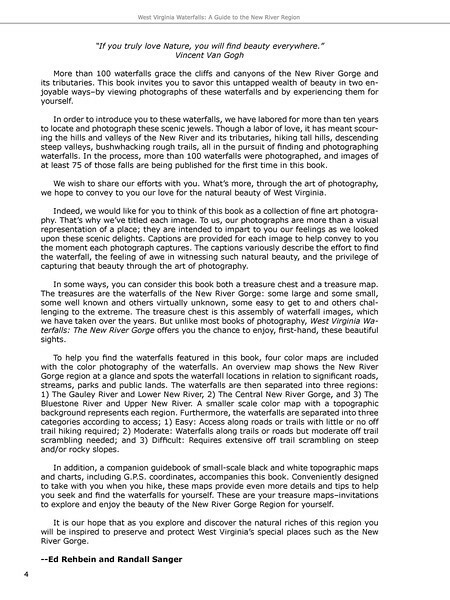 Included in the book is a black and white pull-out guidebook with maps, directions, difficulty levels and GPS coordinates to each waterfall pictured. I invite you to view sample images from the book below, and if you're interested in obtaining a signed copy for yourself or for a gift, please visit the link above.